SAN DIEGO San Diego-based, 3 Blind Mice Window Coverings, Inc., received the Torch Award for Marketplace Ethics by the Better Business Bureau of San Diego. The BBB’s Annual Torch Awards program, presented by SDG&E, recognizes local businesses and charities that have demonstrated exemplary ethical business practices in their relationships with employees, vendors and customers. The entry process for the Torch Award is extensive and winners are selected by a panel of independent judges. “The Torch Awards publicly recognizes and celebrates those companies that are making a conscious choice to conduct their business in an ethical manner,” said Sheryl Charleston, local BBB president and CEO. “San Diego consumers want to do business with a company they can trust. The post-Enron consumer is skeptical and informed. This award distinguishes companies that adhere to the ethical standards of the BBB and have achieved a strong competitive advantage as a result.” Three Blind Mice received the award in the category of 5 to 10 employees. 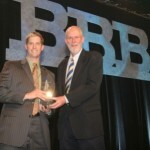 Over 500 business professionals and community leaders attended the awards luncheon at the San Diego Convention Center.